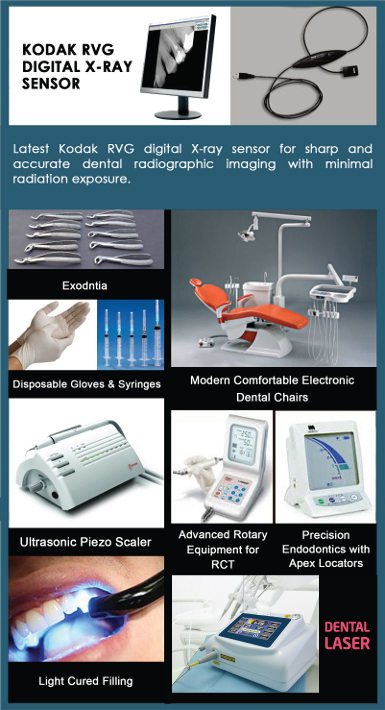 Dental laser treatment using advanced diode Laser equipment. World class treatment facilities in an ultra hygienic environment at the most reasonable prices. Clinic incorporated with the most modern equipments. In-house mini dental laboratory facility. Dental X-ray unit with protective patient lead aprons for maximum safety. Stringent sterilization protocol to prevent transmission of infectious diseases. Only disposables (syringes, gloves, suture needles, drapes, paper cups etc.) used to prevent cross-infection. Experienced specialist doctors to undertake orthodontic, periodontal, endodontic and maxillo-facial surgical procedures. Well-trained assistants and technicians add up to a highly skilled team enabling delivery of quality dental care.